Hi, I’m Jenna. I’m 31 years old and I love to color (inside the lines!). Has the Adult Coloring Bug hit you too? I find coloring so relaxing and the perfect way to unwind. Sometime about the zen patterns in particular really helps me to chill out. Coloring requires little attention and looks pretty when I’m done! 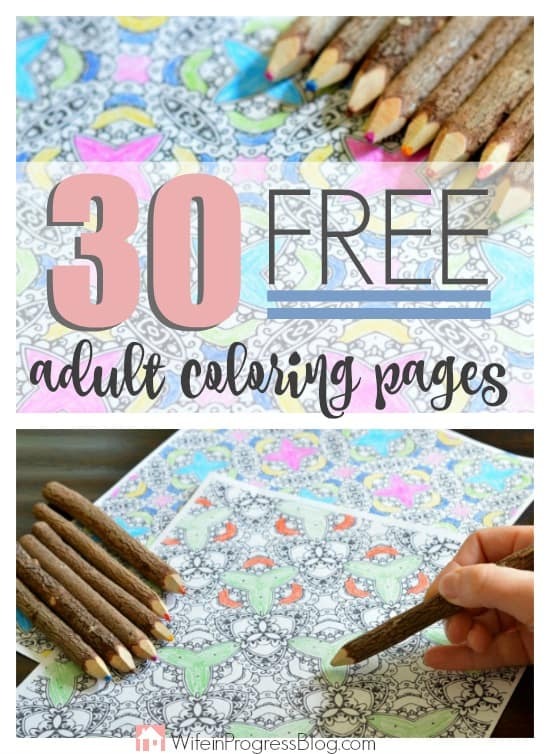 So go on – grab some colored pencils, markers or even your kid’s crayons, then download your 30 FREE Adult Coloring Pages and get coloring! Jokes aside, there’s proven stress relief in what you may consider “just another trend”. Yes, these adult coloring pages and books are certainly trendy but sitting down and coloring in a picture – much like you did as a kid – is very therapeutic! So whether you’ve run out of your own coloring books or don’t want to spend the money to purchase entire books, these printables have your therapeutic coloring needs covered! P.S: How awesome are my branch colored pencils?! I’ve wanted a set for ages and I’m so glad I finally bought them. They look too cute in my office! Worried about all the ink needed to print? My printer uses REFILLABLE ink cartridges. Yes! You heard me! REFILLABLE! I haven’t run out of ink since purchasing the ink kit for this printer. Anytime the ink is low, I pop out the cartridge and squirt more ink into it. It’s that easy! Want in? Check out my Epson printer, the refillable ink cartridges and the bottles of ink. Liked this? Don’t forget to check out the FREE Printables section of the blog! Still need more coloring pages for adults? Check out my Amazon picks below! I was just attracted by the natural tree bark of the pencil. But is it real? Yes the pencils work and have real tree bark!